I’ve been writing here at Mediaite for two months now and as one of the conservative voices on the site I’ve been overjoyed at the support and encouragement I’ve received from the entire team to voice my opinions and make them as strong as I wish. It’s a testament to Dan Abrams and Editor Colby Hall that all voices are welcomed here and our site can find its way to have room for multiple angles on the topics that drive the complex news cycle a media site like ours finds itself in on a daily basis. I’m proud to be a part of Mediaite, but today, I was not proud of a column written by Justin Baragona: Tucker Carlson Isn’t Even Trying to Hide His White Nationalist Leanings Anymore. In fact, I was quite disappointed by it. Don’t misunderstand, I think that conservatives in the media are fair game for criticism on the quality of their shows, on the facts and opinions they present, and even on their clothing and hairstyles. When they’re worthy of the kind of quasi-vicious snark we’ve dished out for so many years they should be prepared to get it, in spades. If I can slam Don Lemon and Michael Moore with abandon, certainly my colleagues can go after Sean Hannity and Laura Ingraham (and me, I’m on the radio every day and cable news every few days, after all) and we’re all grown-ups with egos and platforms and we should be able to take it. I know Tucker and he certainly doesn’t need me to defend him. I also know that he is open to direct and pointed criticism of his positions and his opinions. All of us in the media spotlight need to be open to such criticism. I don’t need to defend Carlson because he didn’t say anything that requires defending. This column is actually a full-frontal criticism of Mediaite and what I see as an unfair attack we published this morning. 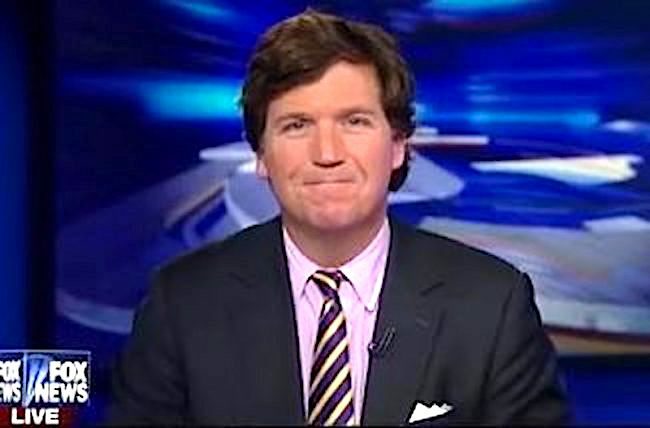 One thing I have always respected about this site that I now call home to my byline is that Mediaite would not stoop to the level of other publications and media outlets whose main tactic against conservatives in the government or media or pop culture is to point at us and scream “RACIST!” And sadly, that’s just what the column did with this unfair attack on Tucker Carlson. Make no mistake, as we now live in the world of “dog whistles” it’s very clear that in the post-Charlottesville era of American media, when one is called a “White Nationalist” one is being labeled a racist. A Klansman, a Nazi. So, what ideas did Carlson present last night that rose to the level of this gross violation of Godwin’s Law? First it was Tucker’s analysis of the current state of the Democratic Party. Tucker maintained that the Democrats have become beholden to extreme identity politics interest groups. Not only is this a relatively accepted, mainstream conventional wisdom idea in Washington DC these days, it’s being echoed by plenty of Democrats. In fact, let’s juxtapose Baragona’s reasons for labeling Carlson a “White Nationalist” against Clinton pollster Mark Penn‘s column in the New York Times last July. At the top of the show, Tucker opened up with a monologue in which he denounced the Democratic Party for being too extreme and unrecognizable to the party it was in years’ past. Fair enough, that is a fairly common argument the Fox News host has made over the past few months and one made by many Republicans. In this instance, however, he sure seems to point the finger of blame at black and brown people. Embracing former President Bill Clinton’s ‘90s stance on illegal immigration, Carlson claimed that the Democratic Party has “has morphed into something that bears no resemblance to what it was even ten years ago.” He added that for decades the Dems were a coalition of Liberal intellectuals, the urban poor and the country’s working class.” According to Tucker, they lost that last group, which was the only thing that kept them “grounded in the vicinity of reality.” Meaning, essentially, that the party was nothing more than poor minorities and the so-called liberal elite. Rural areas have been left without adequate broadband and with shrinking opportunities. The opioid crisis has spiraled out of control, killing tens of thousands, while pardons have been given to so-called nonviolent drug offenders. Repairing and expanding infrastructure, a classic Democratic issue, has been hijacked by President Trump — meaning Democrats have a chance to reach across the aisle to show they understand that voters like bipartisanship. Immigration is also ripe for a solution from the center. Washington should restore the sanctity of America’s borders, create a path to work permits and possibly citizenship, and give up on both building walls and defending sanctuary cities. On trade, Democrats should recognize that they can no longer simultaneously try to be the free-trade party and speak for the working class. They need to support fair trade and oppose manufacturing plants’ moving jobs overseas, by imposing new taxes on such transfers while allowing repatriation of foreign profits. Is Mark Penn “pointing the finger of blame at black and brown people”? What a horrible “White Nationalist” he is. Baragona, then went on to suggest that Carlson is this close to being a tiki torch marcher because he reads Breitbart, or something. CARLSON: There’s stuff you disagree with, but I read Breitbart, I know most people who work over there, there’s no Klansmen. I mean, the Klan is like — that’s just way over the line, in my opinion. “I read Breitbart.” Of course you do, Tucker. Well, with all due respect, I read Breitbart. In fact, I used to work at Breitbart. In fact, I used to be an editor at Breitbart. Am I a “white Nationalist,” Mediaite? Just asking for a friend… actually, I’m asking for my four children. I want to give them a heads-up if they ever Google my name and find out that my employer thinks their daddy is a Klansman because he used to work for Andrew Breitbart. The rest of the attack on Carlson was spent not on last night’s program but on regurgitating other moments in Carlson’s career in the manner of a hit piece penned by the totalitarians at Media Matters for America. Again, I thought we were better than that. Here’s the thing about Tucker Carlson – and pretty much every conservative in the media I’ve gotten to know – he is totally open to discussion, debate and criticism of his opinions. He’s engaged in very detailed and forceful debates his entire public career. He co-hosted Crossfire, for crying out loud. You disagree with him on the state of the Democratic Party? Tell him how he’s wrong. I don’t believe Justin did that in this column. He didn’t provide alternate facts or opinions to rebut him. Instead, this site published an article calling him a terrible name. The sad thing is, if we had presented a persuasive and fact-based argument, Tucker would’ve been the first person to send an email to the author and maybe even invite him on his show for a healthy debate. Instead, this column took what I view as a lazy, childish way out. We can, and should, do better. Members of the media, whom we have the privilege of celebrating and critiquing, deserve better. And, I believe, so do our readers.